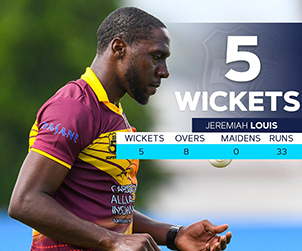 BRIDGETOWN, Barbados – A career-best spell from Leeward Islands Hurricanes fast-medium bowler Jeremiah Louis against hosts Barbados Pride grabbed the headlines in the opening round of Group “B” matches in the WINDIES Super50 Cup on Thursday here. Louis’ delight however, was ruined by a lighting failure and wet conditions caused by rain that forced a no-result in the feature match of group play. Earlier in the day, unbeaten half-centuries from Rovman Powell and Andre McCarthy carried Jamaica Scorpions to a comfortable, seven-wicket victory over joint-hosts Combined Campuses & Colleges Marooners. At Kensington Oval: Louis ripped the heart out of the Pride batting with 5-33 from eight overs, as the home team were restricted to 181 for nine from their allocation of 50 overs, after they chose to bat. Louis poached three early wickets that left the home team in strife on 28 for four after eight overs before top-scorer Kevin Stoute featured in successive half-century stands to take the Pride to a respectable total. Stoute struck two fours and one six in 66 from 107 balls and put on 83 for the fifth wicket with Brooks, whose 53 from 86 balls included just three boundaries. Former WINDIES Under-19 World Cup-winning all-rounder Shamar Springer came to the crease and added 58 for the sixth wicket with Stoute before Louis and left-arm fast bowler Sheldon Cottrell returned to share four wickets and snuff the life out of a late flourish from the hosts. A mechanical failure of one of the lighting posts prompted a lengthy delay and the Hurricanes were left to chase a revised target of 140 from 29 overs. They lost opener Montcin Hodge caught at extra cover for 15 off Marquino Mindley, the former Scorpions pacer, before a stoppage for rain brought the match to a final halt with the visitors on 37 for one off 8.5 overs. At Three Ws Oval: Powell slammed two fours and six sixes in an unbeaten 79 off 63 balls and Player-of-the-Match McCarthy hit four fours and three sixes in 72 not out off 69 balls to lead the Scorpions’ successful chase of a target of 220. The pair shared 135 – unbroken – for the fourth wicket to take the visitors over the threshold with 92 balls remaining. The Marooners had earlier limped to 219 for eight from their 50 overs, needing a 72-run stand between Yannick Ottley, whose 43 was the top score, and Keron Cottoy with 40 to help them cross the 200-run mark. Scorpions’ captain Nikita Miller was the pick of his side’s bowlers, collecting 3-35 from nine overs.